As you will probably be aware, the annual Women’s March took place on Saturday, with millions of women marching across cities in America in one of the biggest political events of the year. The main event took place in Washington DC, but there were affiliated marches all across the country, including in New York City, where a certain Mr. Bryan Cranston just happened to be at the heart of the action on Broadway. 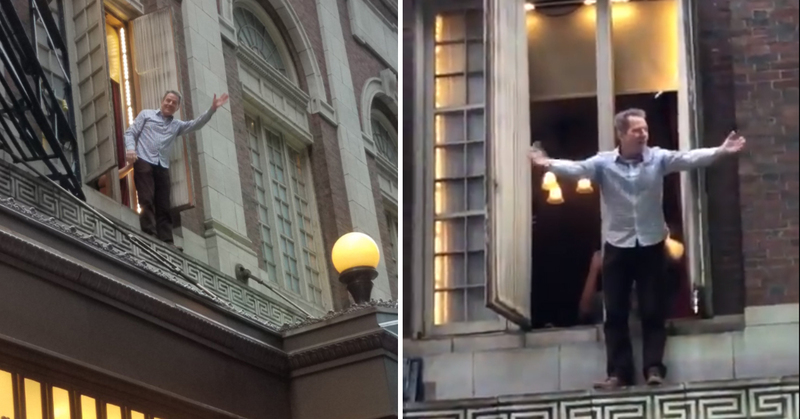 Hearing the march go past his window, the actor stepped up onto a small ledge to give his support. The actor, who is well-loved for his performances in Breaking Bad and Malcolm in the Middle, is currently in the middle of a Broadway run, where he is performing his Olivier Award-winning part in the play Network. Just in case you were wondering why you can see his name in lights right next to him in the video! The crowd were thankful for his support, and whooped in appreciation as a group. The event is even more amazing when you see it from Cranston’s perspective! He later posted the video below on his official Instagram account. “Exciting to witness and support these powerful women of all ages, colors and creeds” he wrote in his caption. The post has nearly 40,000 likes at the time of writing. Whatever your thoughts on the Woman’s March, I’m sure most of us agree that Bryan Cranston is a national treasure!